Hard Rocking, Heavy Rock Drum Loops and Samples! Drum Werks XI is a powerful hard and heavy rock drum loops and samples pack. With a laser focus on high-energy, aggressive rock grooves and tempos, these live acoustic drums are perfect for modern heavy and hard rock as well as classic rock styles. If you want heavy rock drum tracks in the vein of Aerosmith or Led Zeppelin with a bit of Van Halen, Lynard Skynard and Molly Hatchet to boot, Drum Werks XI will get your drum tracks there. With 550+ new heavy rock loops, Drum Werks XI offers beautifully recorded acoustic drums in comprehensive Groove Sets™ from 100 BPM through 200 BPM. With a thick snare, deep kick, and resonant toms, the clean, natural, and punchy rock drum mix of one of the best recording rooms around will bring your heavier rock tracks alive.The drum mix is big and open and will serve your music well as the foundation for any guitar-heavy track and quickly inspire your next hard rock songwriting session. Drum Werks XI is the second installment in the Rocking Nashville Series after the enthusiastic response to Drum Werks IX. Who Needs Drum Werks XI? Anyone who wants to rock, that’s who! The Drum Werks XI UpTempo Rock Collection is a complete groove sample package for all rock songwriters looking to write powerful uptempo rock tracks. A versatile and focused collection of rock drumming from end to end. And, unlike many loop packages commercially available, we’ve loaded this one with enough fills to satisfy any rock songwriter. Keep your DAW happy and feed it Beta Monkey drums exclusively. For anyone writing rock and hard rock genres, Beta Monkey’s Drum Werks Volume XI: UpTempo Rock will inspire and arm your music with a potent collection of straight-ahead grooves, fills, and more. The follow-up to one of our customer’s pick for best rock drum loops pack Drum Werks IX, this time with uptempo power rock drum grooves! 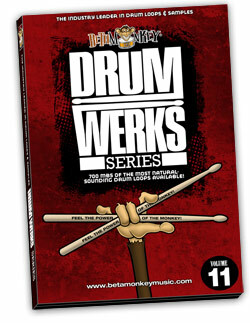 Please Note: Drum Werks XI is a drum loops pack only. All demo tracks containing music are for illustration purposes only. Full Range of Heavy Rock Drum Loops for Classic, Hard Rock and Modern Rock: Comprehensive Groove Folders: 100, 110, 140, and 200 BPM Groove Sets™. Straight-ahead grooves, cross-stick patterns, tom grooves and abundant fill choices throughout each groove folder. Consistent Big Rock Drum Mix and Sounds: A powerfully present snare, deep kick, and naturally resonant toms, the clean, natural, and present mix. 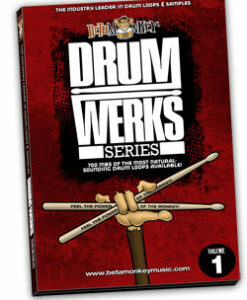 Drum Werks XI features a cohesive drum mix. We tracked and edited all drum loops and samples in a single drum tracking session. Ideal for changing tempos and feels – all drums from Drum Werks XI will mix together perfectly. Fully-Sampled Drum and Cymbal Samples: A complete selection of multi-velocity samples of all the drums and cymbals recorded are included. We sampled the Yamaha Recording Custom set used in tracking, along with samples of a maple Craviotto snare. All cymbal samples (Zildjian ride, hihats, crashes) are included as well. More than Just Loops: In addition to hundreds of powerful drum grooves and fills, you get much more. The download pack features intro figures, buzz rolls, endings, cymbal swells and chokes and more. All the finishing touches and “little” things vital to realistic drum tracks. High-End Production: Recorded in a world-class recording studio. Compatible with Drum Werks IX: Same session, same great sound – only this time a bit faster! 571 (680 MB 24 bit WAV; 482 MB 16 bit WAV) original, license-free ACIDized WAV, APPLE LOOPS/AIFF and REX2 loop formats. 88 (35 MB) multi-velocity drum, cymbal samples. ALL ACIDized WAV, APPLE, and REX2 formats included with purchase and download.